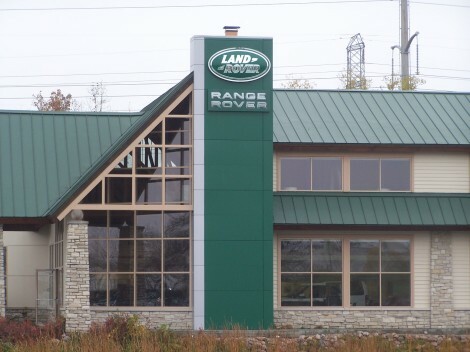 The Land Rover facility re-image program posed some unique challenges with regards to providing retro-fit cladding for the 40’ existing butler brick clad towers. Utilizing new silver and green ACM with alternating hairline and ½ inch joint lines, as well as both radius and square side panels and new signage completed the brand identity. The retro fit process was an excellent fit for our Exact+Site™ 3D Laser Scan service. MDSI was able to scan the existing 50 US locations, each in four hour time slots, capturing all the data needed to produce an art rendering for each dealership. This shows both square and radius panels, and details any interference with doors or windows. The Exact+Site™ process also enabled us to fully lay out the system around the existing roof line and soffit conditions, for precision fit, fabrication and installation of the panel system. Cladding an existing tower which is no longer plumb, true, or square with a very precise, straight ACM system is another challenge that had to be overcome for this program to be successful and consistent from site to site. Metal Design Systems developed a custom structural ladder system behind the ACM panels, which had a self-leveling design, leaving no dependency upon the existing tower conditions and ensured the panels installed level and plumb. The panel system engaged a hook and pin method for adhesion to the ladder, enabling a quick field installation with little disruption to the dealership. The new facility branding was able to be completed typically in a day or two, along with our strategic partnership with Pattison Sign Group and 3A Composites. 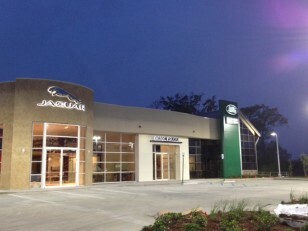 The Land Rover Facility re-image program provides the dealerships a very clean, contemporary and polished look with very low maintenance for their dealership. We can bring your design to life. ©2019 Metal Design Systems, Inc. All rights reserved. No duplication without written permission.